150mm adapter for large camera heads that use a 150mm ball base for leveling. This is a quality, made in USA product that will also fit other standard Mitchell Mounts. 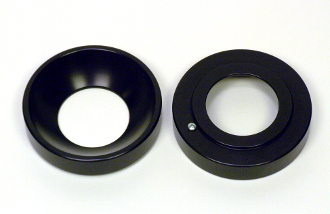 The 150mm adapter measures approximately 6.5" round by 1.5" tall. 6061 Aluminum. Hard Black Anodized. Works with all Dana Dolly items.